After walking all night he reached the spot at 3 o’clock in the morning, in the midst of a snowstorm and having tied a cord to his life preserver he swam off. On the island he tied the rope to a stone and climbed up the ruins to the nest. He then found he had left his cap behind and tried to carry one egg in his mouth, but could not breath. At last he swam back with an egg in each hand. He blew the eggs in the boathouse, washing out the insides with whisky. By the 1870’s in England and early 1900’s in Scotland there were no ospreys left to predate. Looking at KL’s eggs, we can hardly imagine the motives that drove those past collectors or the value they placed on obtaining lifeless egg shells. 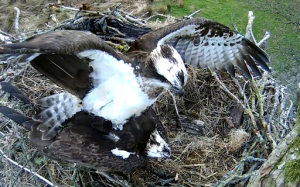 For the majority of people looking at KL’s eggs today their value is now perceived to lie in the growth that is happening inside the shell and their viability to produced new ospreys. A change of heart that affects the entire natural world. At 16.26 Wednesday April 23rd KL laid her first egg! At 16.26 today KL laid her first egg! Unusually, she produced the egg within the Whinlatter Centre opening times and a fair number of osprey staff and visitors were glued to the CCTV screens and were able to witness a unique occasion. The whole procedure took about an hour, with noticeable changes in KL’s behaviour. Her stance in the nest changed from being fairly upright to holding herself lower. This alternated with restless pacing around the nest cup and anxious peering down between her legs. Then she flattened her back and splayed her wings out slightly and we could see ripples of effort across her back as she made a great push. Surely this was the moment – but she again started pacing. In the end after just the slightest shudder she relaxed and as she moved sideways slightly we all caught a glimpse of a round dark looking sphere. Within seconds she had it covered and with the characteristic wriggle of all brooding birds she got it into a comfortable position and tamped herself down firmly to start the next 36 days of incubation. A few minutes later Unring landed beside her and rather hesitantly she drew back to let him have a look. (Click the blue link above) However, as you can see, at this point he proved a less than interested father, concentrating instead on busily moving sticks. It was if in the flurry of nest construction work over the last 2 weeks he had forgotten the reason behind it all. He did not even curl his toes in to guard the egg from his talons. Let’s hope it all comes back to him before his first incubation stint. With another sunny day passing by KL seems to be quite happy to hold back on the egg front. Her mate, ‘Unring’ is doing everything he can to make life comfortable for her – as he has from the moment of her arrival. He has been catching fish- some really enormous ones- so that she is rarely seen without at least a tail end in her talon and he has spent a lot of energy bringing up manure covered grass clumps and tenderly strewing them around the nest cup. (Happily, the fertilizing element washes off quickly when it rains, leaving the hay behind) The nest cup is slowly deepening as he pushes and paddles it into shape with terrier tenacity. An incident on the nest today showed clearly how intently he is studying her needs. KL was waiting on the nest when he flew in with a slim jack pike. As she took it she also wrapped her claw around the end of a twiggy branch. Every time she attempted to move the fish the branch twisted around also until fish and twigs and toes were well tangled. At this point Unring who had been trying to see what was happening, deliberately leaned forward and gently jerked the twig free from under her. With fish and foot released she was able to spread her wings and fly off to eat it on a nearby branch. It was a touching moment – although more prosaically high investment in his mate should pay off in ensuring his genes have the best possible start in life. After a couple of weeks of courting, displaying and mating, the time is nigh for KL to lay her clutch. Today she has spent lots of time at the nest, rearranging, digging and taking much of the material the male brings in. The nest is superb, the cup seems ready, so soon… very soon, we should welcome our first egg. Lake District Osprey Project Welcomes All. 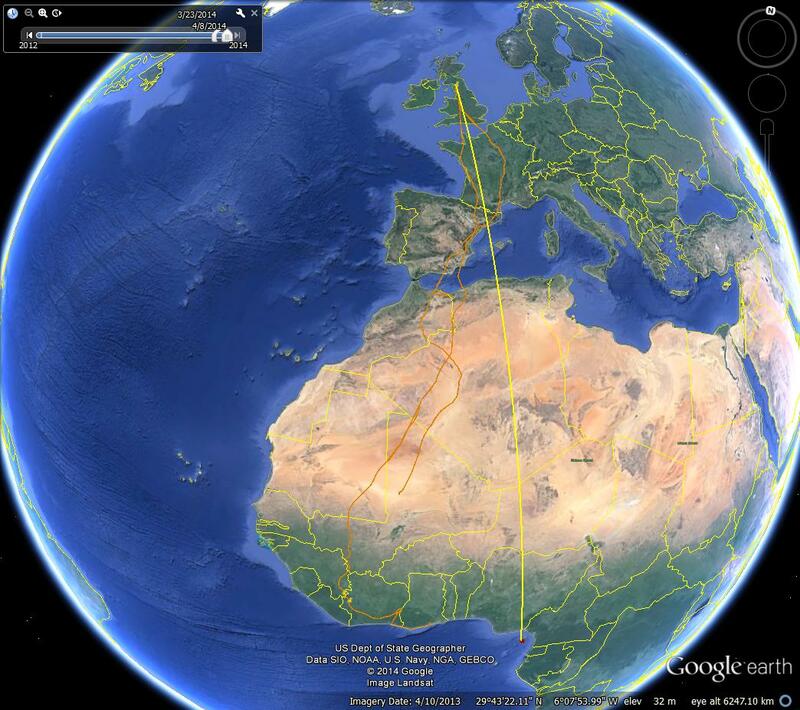 What a week the Lake District Osprey Project is having? Dear old Number 14, as of 10.00am this morning, sitting it out on the island of Bioko, Equatorial Guinea. 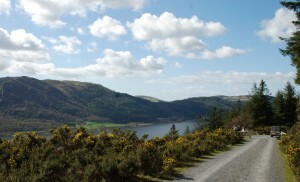 Two ospreys around the nest at Bassenthwaite, brilliant pictures being streamed through to Whinlatter Forest Centre. 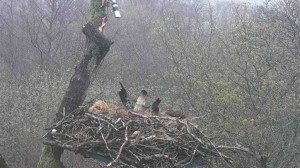 Good live views of the ospreys from the two viewpoints at Dodd Wood. Red Squirrels, Lizards and Slow-worms crossing the track for all to see and even the weather set to be on our side over the week-end. Not forgetting the promise of Easter Eggs of course! How can you stay away? Whinlatter and the Lower viewpoint open 10.00am to 5.00pm, Upper viewpoint 10.30am to 4.30pm every day. 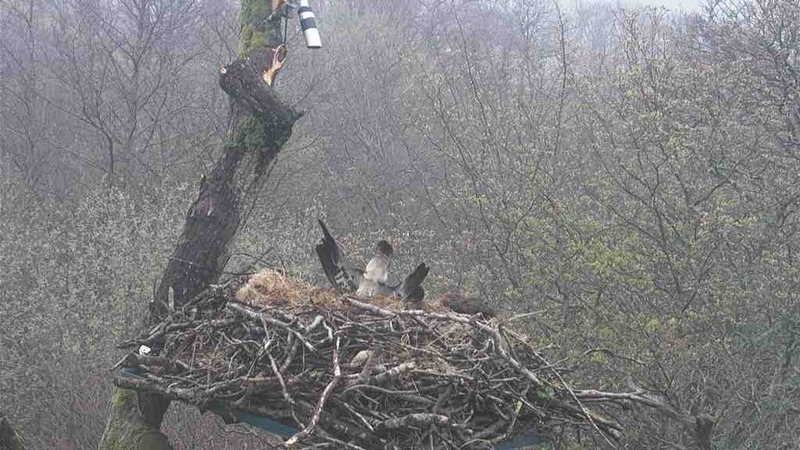 Tail Up, Tail Down at The Lake District Osprey Project Nest. What ever it is that is going on here there has been rather a lot of it since Monday. This photograph is dedicated to Pete D who takes a great interest in tail position at such events. Eggs for Easter maybe……………………. Two ospreys sitting in a tree looking at the weather clouds passing them by. For one of them thunder and lightning looms; on Bioko it is the seasons of sudden storms and Number 14 sits in a tree waiting for the storm to pass. On Bassenthwaite 3,600 miles away (as the crow flies, not the osprey) an osprey sits looking through the mist; the difference is since yesterday morning this osprey is not alone.